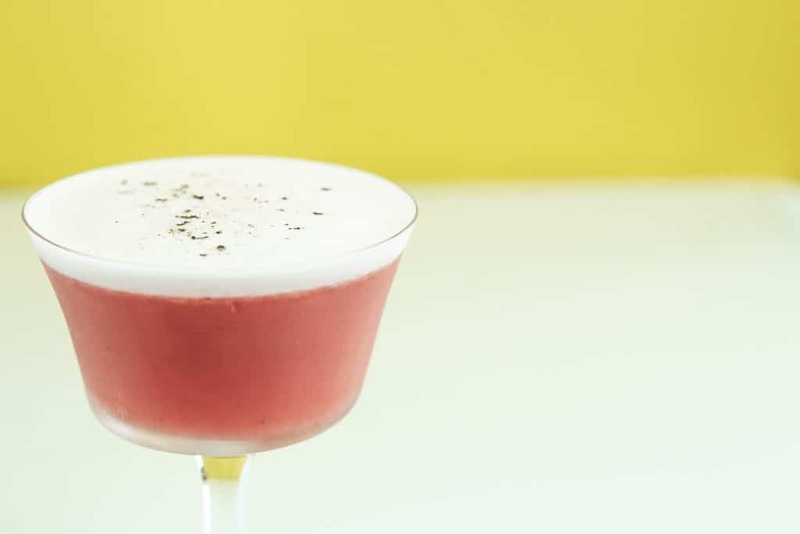 It’s slowly starting to feel like Spring, and I’m bringing you another instructional video that shows you how to make this incredible spring-inspired Gin Sour! It combines some of my favourite flavour pairings, which is Strawberry and Black Pepper. See how I mix it up here! First off, I have to give a big shout out to my man Juan Angel. He’s an extremely gifted videographer, and I love the mood he portrays in these videos and stepping out of that typical ‘Tasty’ style Instructional Video we always see. 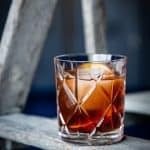 I hope you love them as much as I do, and they help you with your Home Bartending journey! This is not the first time I’ve combined Strawberry and Black Pepper. It’s one of my favourite combinations when it comes to flavour pairings, and it always seems to throw people for a loop. With Strawberries flooding the markets, this is the time to bring out your saucepan and make this very tasty Strawberry and Black Pepper Reduction. 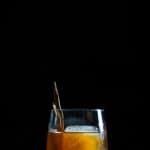 It’s shaken up with this cocktail, but you don’t have to just sip on the cocktail to enjoy this reduction/syrup. Add a small tablespoon to your water and some lemon for a delicious refreshing Strawberry Lemonade, or you add it on top of your pancakes for the weekend! 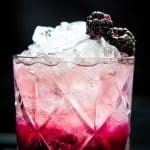 I’m always trying to encourage people to find different ways to incorporate syrups, because it doesn’t have to be all cocktails! For the recipe, make sure to follow the link attached above in this paragraph. When it comes to putting this cocktail together, it’s fairly easy. Simply place all your ingredients into a shaker and DRY SHAKE. Reminder, dry shake means shaking without ice. This allows for a much frothier foam since we are using egg whites in this cocktail. I can feel the alarms going off in peoples heads thinking why would I use raw egg whites in a drink, but it truly is safe when you’re picking up a quality product. With our current health regulations in Canada, picking up a carton of egg whites is one of the easiest ways to ensure your safety. 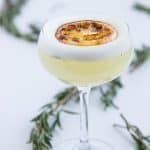 If you’ve never shaken up a sour with egg whites before, test it out at a local, reputable bar. Get those nerves out and trust the professionals, but if you’re willing to give it a try, you won’t be disappointed. Think of the egg white experience as that delicious foam on top of a latte. Sure you don’t TECHNICALLY need it, but it really adds to the whole experience! There’s one more thing I wanted to mention before diving into the recipe and that’s ironing out which gin to use. This cocktail offers a lot of flexibility. A London Dry Style is obvious, or even a Plymouth! But today I wanted to use something that would compliment the Strawberry and Black Pepper Notes and that’s why I brought out the Caorunn Gin. This handcrafted Scottish Gin uses 5 unique foraged botanicals, including a Cool Blush Apple. These subtle notes made it simple to choose this gin for this cocktail. If you haven’t picked it up Caorunn before, you definitely need to give it a try! 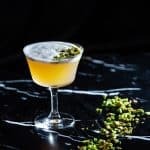 A delicious Gin Sour recipe inspired by Spring and my favourite two flavour pairings. 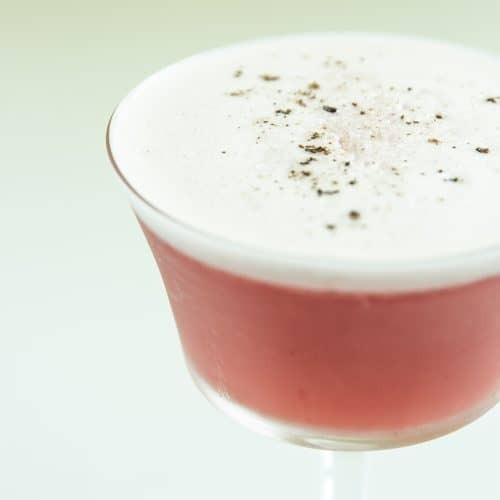 It combines Caorunn Gin, with a Strawberry Black Pepper reduction, Fresh Lemon and Egg Whites! In a shaker, add all ingredients and give it a dry shake (without ice), for approximately 30 seconds. Add ice into the shaker and shake once more for another 30 seconds. Double Strain into your favourite coupe glass. For details on the Strawberry Black Pepper Reduction, follow the link attached! The reason I double strained this cocktail was to avoid too much of the black pepper seeds from seeping through. That last thing I need you to do is choke on a little bit of black pepper.